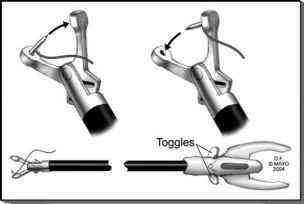 For the transperitoneal approach, a 3-trocar configuration is used (Fig. 1). At least one 10 mm port is necessary to permit intracorporeal suturing. A 5 mm port is placed halfway between the umbilicus and xiphoid process in the midline. A 10 mm port is placed at the umbilicus. 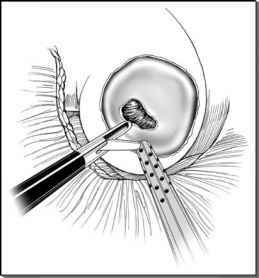 An additional lateral 10 mm trocar is placed lateral to the ipsilateral rectus muscle at the level of the umbilicus (Fig. 1B). I For right-sided pyeloplasty, liver retraction may be necessary. If so, a 2 mm or 5 mm port can be placed just inferior to the xiphoid process, and a locking grasping forceps used to tent up the liver edge and grasp a segment of the triangular ligament or portion of the peritoneum. This will function as a self-retaining liver retractor. This obviates the need for a surgical assistant to retract the liver. Therefore, your surgical assistant can concentrate on providing a good camera image. FIGURE 1 ■ (A) Trocar placement for retroperitoneal approach; (B) trocar placement for transperitoneal approach; (C) alternative trocar placement for transperitoneal approach. aEthicon, Summerville, NJ. bU.S. Surgical Corp., Norwalk, CT. FIGURE 2 ■ Endostitch™ (Autosuture Co., Norwalk, CT). The toggle from movement transfers the needle from jaw to faciliate suturing. If a crossing vessel is identified, the ureter needs to be freed up completely from the vessel to facilitate eventual transposition. The renal pelvis needs to be freed up as much as possible to enable possible ureteral transposition and a tension-free anastomosis. at the junction of the 12th rib and the paraspinal muscles. This can be done under tactile guidance (with a nonbladed trocar) or under direct vision. A 5 mm trocar is placed anteriorly, about two fingerbreadths above the iliac crest.